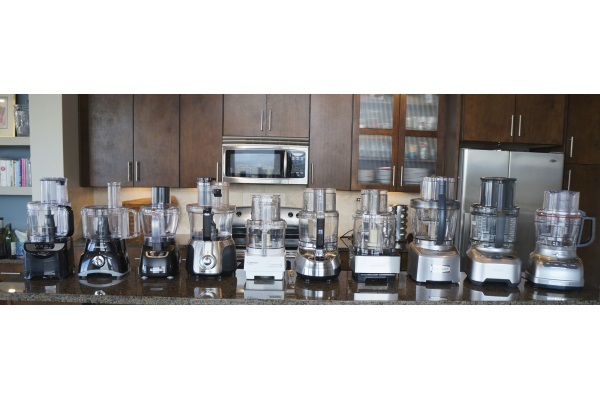 What is the best food processor available? Product Report Card's team set out to find out. 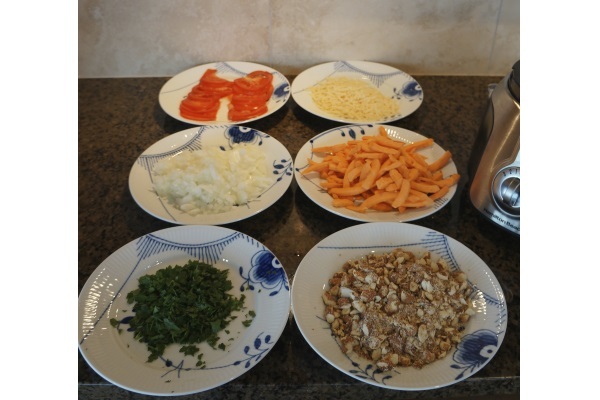 When the food processor was invented in 1973, it revolutionized the cooking industry and quickly became a fixture in well-equipped home kitchens. 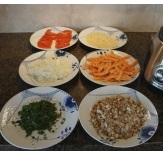 With just the push of a button, a food processor can quickly prepare food that previously had to be prepped by hand. 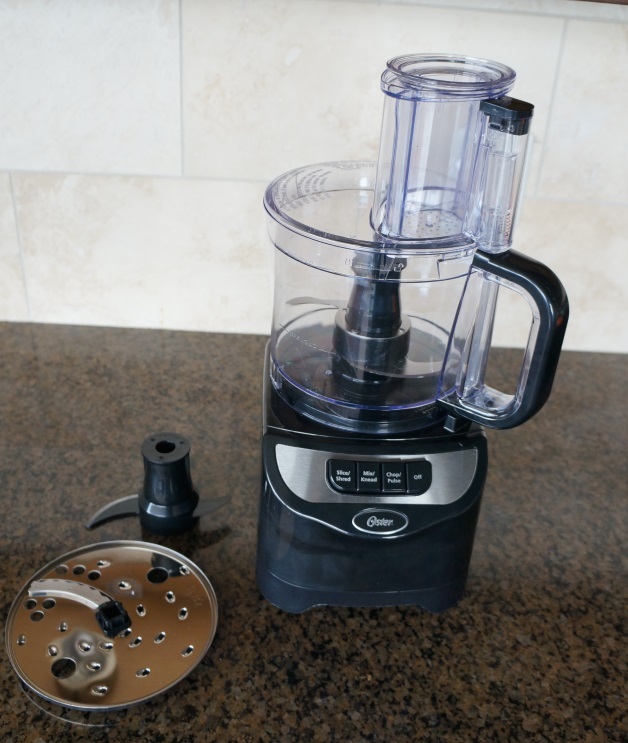 Nowadays, there are so many different food processors on the market that it can be difficult to differentiate between them. 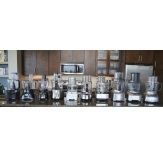 We have reviewed some of the top food processors available to help you find the best one for your kitchen. 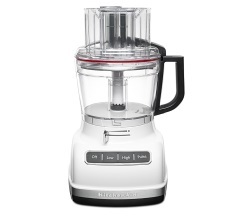 Finding the best food processor. 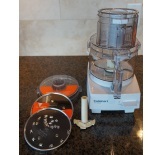 There are three primary types of food processors available. Choppers are the smallest size at 4-5 cups, then mid- size range from 7-9-cups, and full size are 11+ cups. This review doesn't cover choppers because they are a specialized category and need to be evaluated separately. 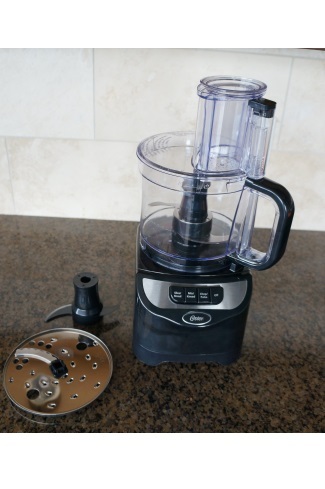 For mid and full size machines, your budget and how you plan on using your food processor will determine the best machine for you. When we evaluated functionality, we considered how versatile and user-friendly each machine was. We assessed work bowls including the dry/liquid capacity, the number of attachments it had, the size and position of its feeder tubes, and its controls. While the majority of machines we tested only came with one work bowl, the Breville Sous Chef, Cuisinart Elite 2.0, and KitchenAid food processors all came with a 2nd smaller work bowl. We found that this enhanced the overall versatility of the machine and eliminated the need for buying a separate chopper unit. The right capacity for you will be determined by the size of your household, and how you plan on using your machine. We thought the unit's liquid capacity relative to its dry capacity was an important factor in the overall versatility of a machine. If you are big on soups, salsas, and other liquid projects, be sure to look at the liquid capacity of each machine as it is often much less than the dry capacity. 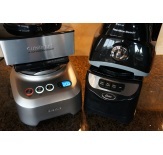 The two machines with the most liquid capacity were the Cuisinart Elite 2.0 and Breville Sous Chef. 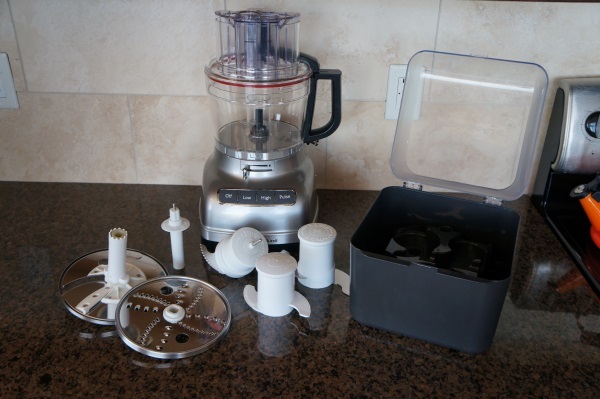 After capacity, we examined the attachments that each food processor came with. 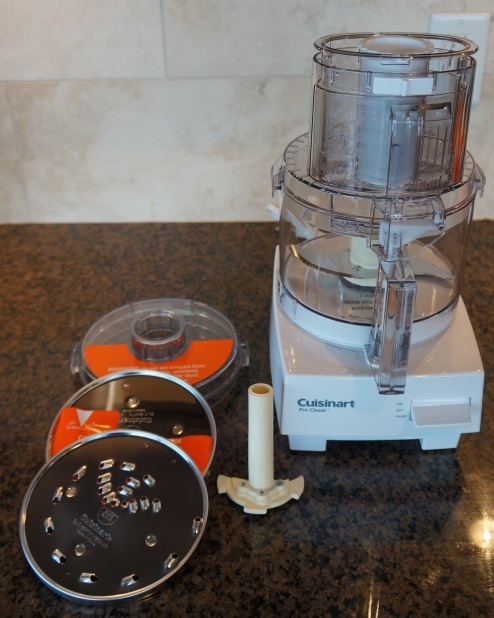 You really only need the basics (an 'S' blade and discs for slicing and shredding), but additional attachments for processing dough, emulsifying liquids, or julienning vegetables, etc. can be a nice bonus. 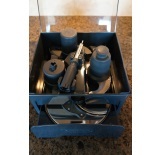 We awarded points to units that had reversible shredding discs and adjustable slicing blades because they offered more versatility without taking up additional space. No machine comes with more attachments than the Breville Sous Chef, but we don't think they are all necessary, and you pay a premium for them. The Cuisinart Elite 2.0 comes with a great array of the most basic attachments without overloading you with extraneous accessories. Helpful attachments on the Cuisinart Elite 2.0. Next, we evaluated the units' processing settings. There were three different styles of controls included in our test: paddle switches, knob controls, and touchpad buttons. Some people like the classic look and feel of paddle switches (usually found on Cuisinarts) while others prefer the look and feel of easy to clean touchpad buttons. We assessed each control panel's responsiveness as it allows for more precise processing of ingredients. Our favorite paddle switch was on the Cuisinart Pro Classic, but we thought the Breville Sous Chef offered the most precise processing ability because of its responsive buttons and built-in timer function. Our least favorite control pad was the KitchenAid because the buttons were very difficult to push. Lastly, we evaluated feeder tube systems. The factors we considered in this part of our testing were feeder chute sizes, positions on the lid, and integrated safety systems. We like having feed tube size options (everyone likes a big feed tube to help eliminate paring down ingredients) and we also found that we prefer the feed tube to be oriented on the front of the machine for convenience. 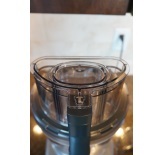 The two biggest feeder tubes were on the Breville Sous Chef and the Cuisinart Elite 2.0, but the safety mechanism in the system requires some paring of larger food items. 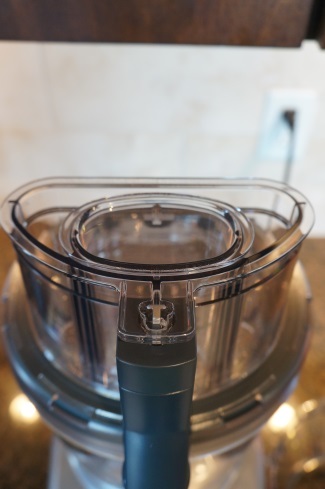 Although this is typical in higher end machines, it was a hassle and made us appreciate the Hamilton Beach Big Mouth because it offered continuous feeding through the large chute. In terms of overall functionality, the Breville Sous Chef just barely beat out the Cuisinart Elite 2.0, Hamilton Beach Big Mouth, and KitchenAid. It excelled in every criteria of this category and edged out its competition thanks to its comprehensive list of attachments and built-in timer. Not surprisingly, the more inexpensive food processors, the Hamilton Beach 8 Cup and Black & Decker 8-Cup, performed poorly in this category. Each of the food processors was evaluated on its ability to chop onions and parsley, slice tomatoes and potatoes, shred carrots and cheese, and whip cream. On the machines that could handle heavier jobs, we also made almond butter and kneaded pizza dough. We considered the precision in each processing job, how well things looked (and tasted), and how much food waste was produced. We also consider each machine's noise level and how stable is was during testing, particularly on heavier jobs like kneading dough. 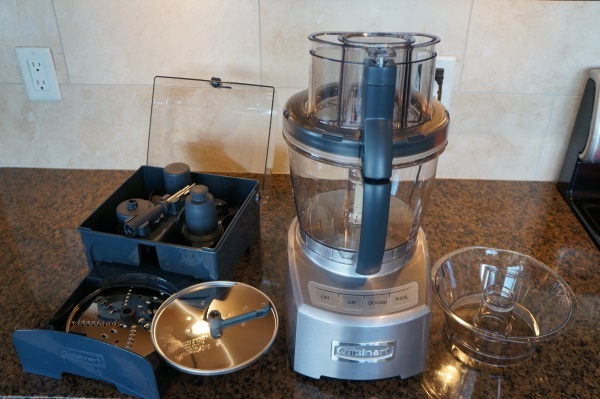 Test results with the Hamilton Beach Big Mouth Deluxe. 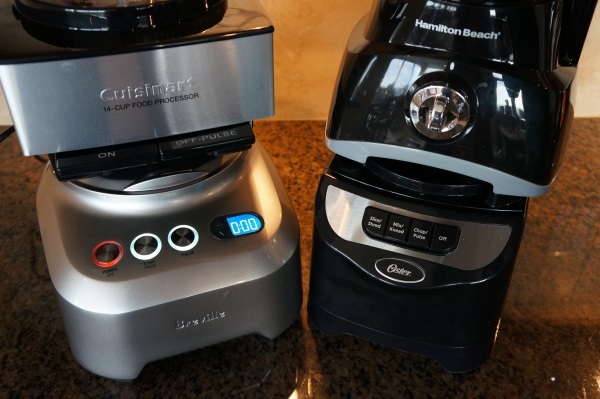 Overall, we thought Breville Sous Chef and the Cuisinart Elite 2.0 performed the best in the majority of our tests. They were able to perform all the tasks we asked of them quickly, precisely and efficiently. They were also exceptionally quiet and barely moved at all during the testing. The Cuisinart struggled with whipped cream, but we still thought it did an exceptional job. 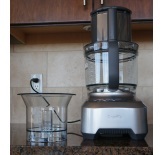 For its price, we also thought the Cuisinart Pro Classic did a remarkable job in all of our tests. Not surprisingly, the biggest loser in this category was the Black and Decker 8-Cup, which was the least expensive food processor we tested. It was loud and produced inconsistent results from chopping onions and parsley to slicing tomatoes. 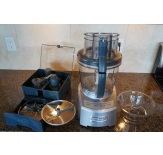 We did our best to seek out easy-to-use food processors. After all, the more straightforward set-up and clean-up are, the more likely you are to use it. 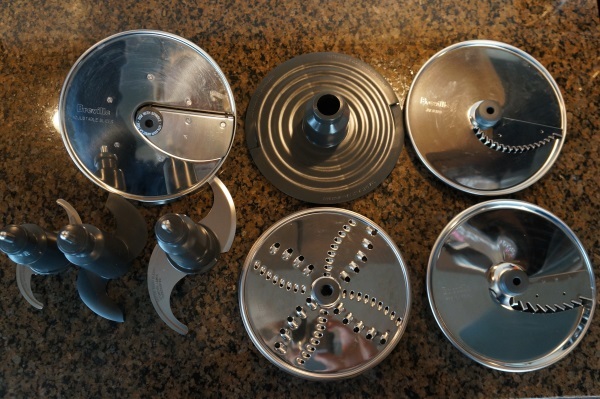 We found that some of the more expensive units like the Breville Sous Chef and the Cuisinart Elite 2.0 were more difficult to clean because they feature complicated seal systems on their lids. 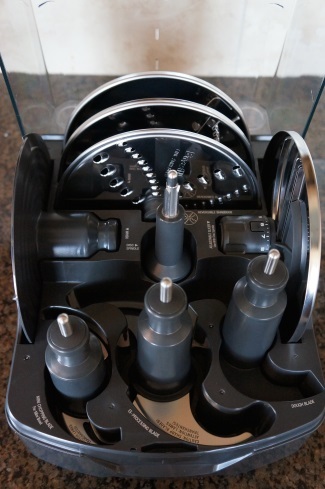 Others units had more frustrating feeder tube set-ups to clean like the Cuisinart Pro Classic, Hamilton Beach Big Mouth Deluxe, and the Oster Total Prep. The KitchenAid was one of the easiest to clean as were the Black & Decker and the Hamilton Beach 8 Cup. 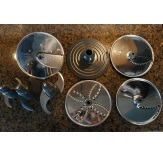 Most of the food processors we tested were easy to assemble. A few models had quirks that we had to get used to, but none stood out as exceedingly difficult. This consideration is pretty basic. 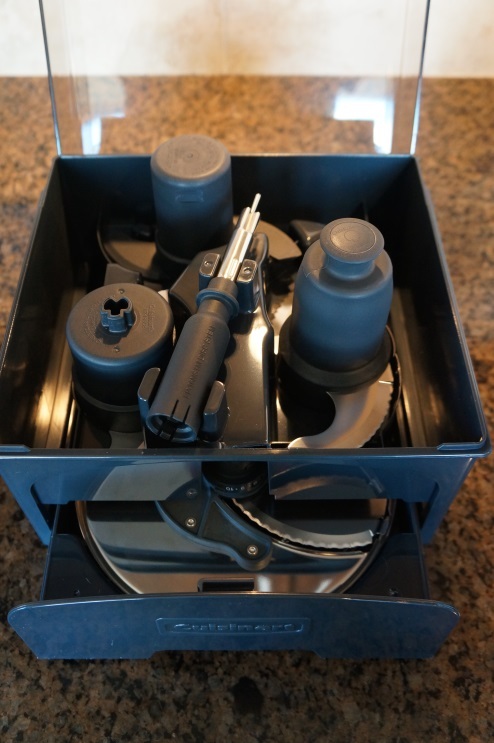 Some food processors like the Breville and the Cuisinart Elite 2.0 are heavy and hard to move - plus you need to find space for the machine and the blade storage case. Others, like the Cuisinart Pro Classic slip easily beneath a cupboard. We compared the weight, cord storage, footprint, and blade storage of each machine we tested. Obviously, it will be easier to fit a smaller, lighter unit like the Black & Decker, or Oster, into your home kitchen. However, if you have a bit more space and want blade storage included in your purchase, the Breville, Cuisinart Elite 2.0, and KitchenAid offer you that option. 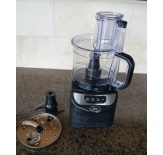 The overall winner in the food processor category. 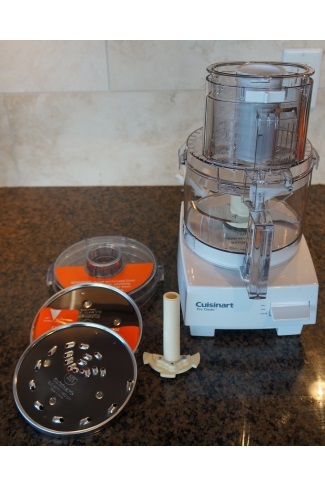 The Cuisinart Elite 2.0 was our Overall Winner. 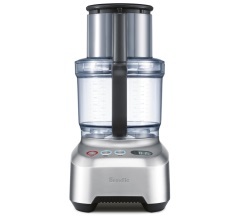 Although it has functionality and processing quality akin to the Breville Sous Chef, it was $100 less. 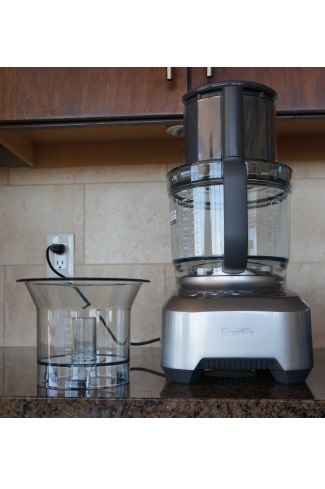 The Cuisinart Elite 2.0 was versatile, stable, and powerful. With an excellent warranty, blade storage, and whopping capacity for a home processing unit, the Elite 2.0 handled even our most rigorous test with ease. The quiet motor and sharp blades turn out fast, consistent tomato slices or nicely chopped onions. 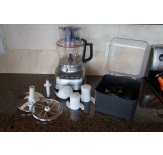 If this food processor is in your budget, and you have the space to store it, we recommend this model without reservation. Our Editor's Choice award winner. The Pro Classic endeared itself to us in several ways. First, at $100, it is a great value and you get all the processing capabilities of a bigger machine. From dough to almond butter, this little workhorse can do it all. We like the compact size of this unit and felt that it had adequate capacity for most households. 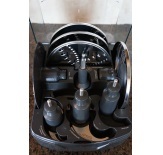 We also loved that it came with an easy-to-clean flat work bowl lid in addition to the lid with feeder tubes. With an excellent warranty and a great work top, we were sold on this model and it easily won our Editor's Choice Award. Our Best Buy award winner. 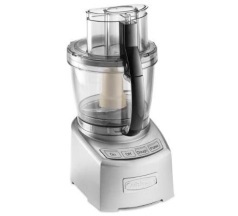 For $60, the Oster won our Best Buy Award as the most affordable, yet capable, food processor in our lineup. This was the most inexpensive processor able to knead dough that we tested. It did a nice job on our pizza dough. In addition, it did a good job with our other test as well. It has a large feed tube and was able to turn out decent results in slicing, shredding, and chopping, especially for this price point. That being said, you do sacrifice some processing quality for the affordability.